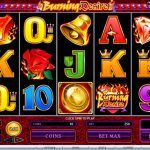 When we look at Burning Desire, a video slot game from Microgaming, judging by the symbols we can say that this game is a bit outdated. So, you are probably thinking why this slot is still appealing even today. The answer is simple you can win up to 90,000 coins. We have the usual card symbols, diamonds and BARs, but the rose symbol gives this slot a romantic touch. There are 2 special symbols in Burning Desire that can bring some joy to us. The burning heart with the game’s logo is the wild symbol. This symbol appears only on the second and the third reel and it substitutes for every other symbol except for the scatter. The gold coin with a heart is the scatter symbol and also the key to the main feature. 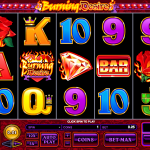 If you manage to land 3, 4 or 5 scatter symbols you will receive 15 free spins with all the wins tripled. The good thing here is that the free spins can be re-triggered if you land the desired number of scatters. 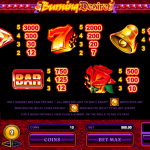 Burning Desire is one of those games from Microgaming that is still appreciated even today. We are not surprised why that is so. The game is simple, so you do not have to worry about complicated features and how to trigger them, and it offers some good payouts. Aren’t we all excited about that? The betting range is wide so every kind of player can find the betting size that best suits their bankroll. And as the icing of the cake we have one of the most popular main features here, the free spins round. This is where your balance can change drastically for the good. Another super fun slots game you should consider playing is Big Top a 5 reel slot by MicroGaming.